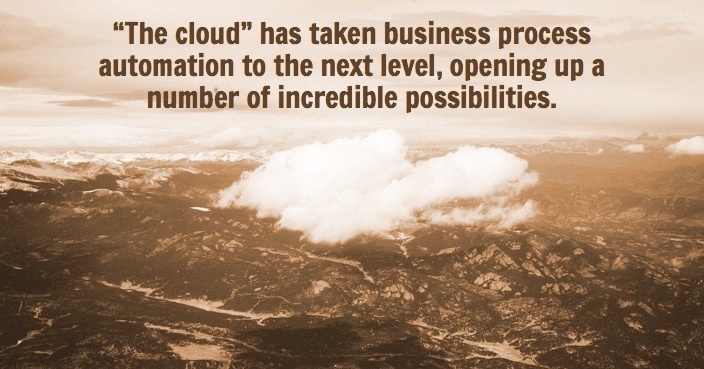 The term “cloud” has been slowly introduced with a mysterious aura over the last few decades. The very word suggests ambiguity and vagueness when referenced to the internet. Overall, it’s a simple concept. “The cloud” is simply internet-based services—and yeah, it’s still pretty vague. Prior to its recent use, the term “cloud” was used in reference to network services both local and wide area. Today, the cloud has become a vital tool for modern businesses. Whether they realize it or not, many businesses streamlining their processes rely on a number of different services from various providers all over the globe, especially if the business depends on mobile technology. “The cloud” has taken business process automation to the next level, opening up a number of incredible possibilities. Business infrastructures inherently become more complex as they grow. Over time, leveraging an owner’s memory and notepads become less and less efficient. As brilliant as some business executives might be, relying on their mental capabilities becomes a growing stumbling block that hinders growth and productivity. This leads a company to seek more innovative solutions to keep tabs on day-to-day operations and collect the information needed to take care of their customers. The executives inevitably find themselves seeking out business automation solutions as a way to dependably establish patterns within the regular workflow. A cloud-based software strategy to automate business processes in order to reach the organization’s objectives is worth consideration. Most businesses will share the following goals. Time is money. If you can make more money in less time by automating, then it’s probably a good value add. With the ability to deliver information to various devices, implementing cloud services simplifies getting the right data to the right people at the right time. It’s pretty self-evident that by automating business processes internally, you may be able to significantly reduce costs. Imagine unifying those costs to one single data set accessible throughout multiple locations across the globe in near real-time–and needing to be entered only once. Enormous cost and time savings are found by simply integrating a system that minimizes paperwork or manual data entry. I think it’s a pretty accurate assumption that most businesses welcome new revenue sources. The right cloud-based business automation implementation can often open doors to new opportunities and ways to increase revenue. Many companies struggle to keep employees and sub-contractors educated and informed on best practices, latest innovations related to the industry, and staying up-to-date with compliance measures. The management alone of this information can be a nightmare if done manually. Cloud-based solutions help with distribution of training material, auditing, and routing questions. Getting this resource-zapper under control and automated as much as possible can be a sanity saver for many businesses as they grow. Nobody likes errors, yet everyone is a producer. Unifying data entry and notification flows are just a couple aspects of business automation that help reduce errors that can be introduced to a company. Minimizing errors in turn minimizes support, data analysis, and, of course, error correction. At the end of the day, data is what every business thrives on. Business automation technology associates metrics with each of the tasks involed, increasing metric visibility and overall understanding. I’m all for using the cloud, but remember that implementing the cloud needs careful thought. Not everything needs to be implemented immediately. Some tasks will also need to be carefully considered prior to the shift. Take some time and consult where needed to identify where to start and how aggressive to make the transitions. BY Ben WhitakerShould Mobile Application Development Be Part of the Business Strategy?